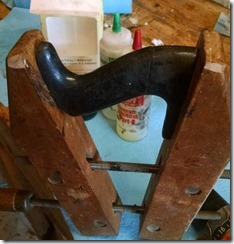 Fixing a Bench plane tote. There are several reasons a tote on a plane breaks. Seasonal expansion & contraction of the wood. 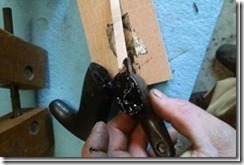 The metal screw is tightened in the wintertime when the wood is dry, and then in the summertime, the wood expands as it picks up moisture from the humid air. 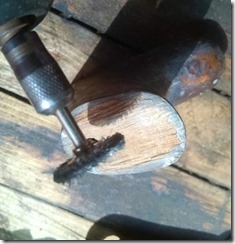 The head of the tote screw digs into the wood unless the tension on the screw is backed off. At the approach of the cool, dry season, the wood shrinks again and the screw becomes loose. 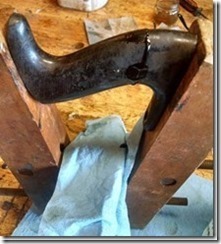 If the plane is then used with the tote screw loose, there is a strong likelihood that the tote will be broken by the excessive bending stress in the cross grained tote. The tote depends upon the tension in the tote screw to support the bending load without placing the heel of the tote under tension. As force is exerted forward, the screw has an opposing force to keep the tote together. The angle of the screw. The tapped angle of the planes were never precise. You will see screws bent to make up for this. 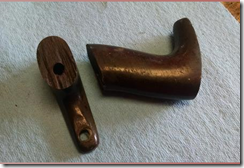 Many of these bent screws were purposely bent to make up for the difference in the angle between the pre-manufactured totes and the drilled angle of the plane. If the break is dirty. 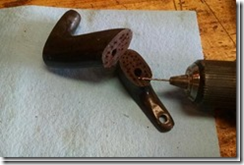 I use a Dremel tool With a Dremel wire wheel To clean it up. Take care to stay away from the edged so you don’t round them over, making the repair much more visible. If you’re interested in making a new tote, click here for some advise. The next thing I do to repair a tote, is drill a series of hole to allow the epoxy to grab. 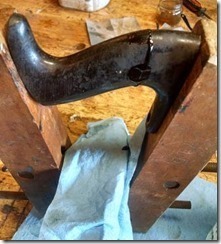 Dry fit to the clamp. Once its set, you can push the tote into it. You typically won’t even have to move the screws. 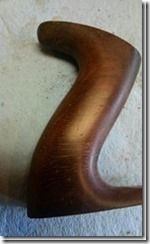 If it’s rosewood or another oily type, wipe it off with thinner and let it dry. Here is the epoxy I typically use. And don’t forget the color for it. 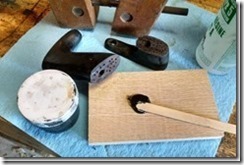 Work the epoxy into your holes well. 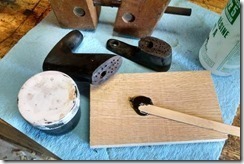 I like to coat both sides of the break. Sand and finish to your desire. 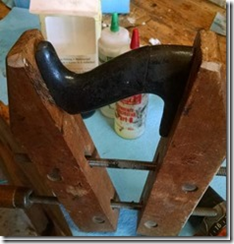 A note about sanding the epoxy. Try to resist cutting or scraping the epoxy bulge off. It tends to pull some out of the crack, and will leave a gap. Sand it all off and you’ll see better results. 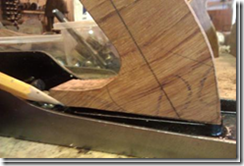 On my Making a Tote Page I show how to check the angle. Do the same for your existing totes. 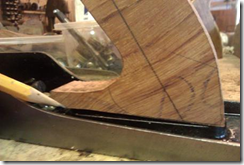 You can either carefully bend the tote screw to match the plane angle, or sand the bottom. For existing totes, bending the screw is probably preferred. I recently started using spray lacquer. Its quicker and easier and brings it back to original. Most totes came from the factory with a lacquer finish. So far I have found the Rust-Oleum brand works the best. 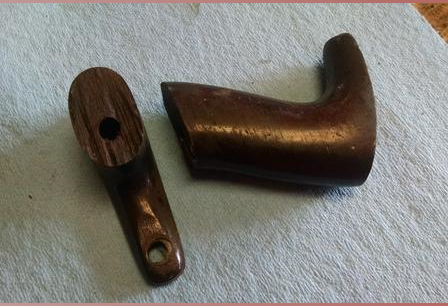 Next post Saving a Stanley Type 2. Risk equals reward.